Half of the 81-seater buses will be fully open-top and the rest will be of a half-top design. Twenty sight-seeing open-top double decker buses, built by Chinese manufacturer Anhui Ankai Automobile, are to be delivered to Big Bus Tours in early 2012. 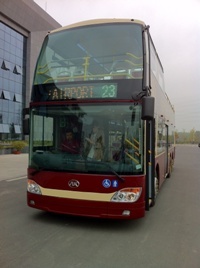 The operator and manufacturer have been in a working relationship since Ankai first delivered buses to Big Bus Tours for operation in Dubai in 2007. Big Bus Tours operates a combined fleet of over 300 sightseeing buses worldwide, with Ankai vehicles incorporated into services in cities including Abu Dhabi, Hong Kong, Shanghai, Las Vegas, San Francisco and Philadelphia. The 81-seater buses will be equipped with Cummins Euro 5 engines, Voith gearboxes, and ZF axles. Half of the delivery will be fully open-top and the remaining 10 will be of a half-top design. A prototype vehicle has already been manufactured by Ankai, and has been inspected by VOSA in relation to the intended IVA certification for UK operation. The prototype vehicle will arrive in January 2012 with the other 19 buses arriving in time to be deployed for the start of the summer. Big Bus Tours received six Optare Visionaire open top buses based on Volvo tri-axle chassis for use on its central London tour routes from Optare last March. This brought the total number of Optare Visionaires in the Big Bus Tours fleet to 26. Ankai manufactures large and medium size coaches, buses and chassis, ranging from the standard offering and also serving the luxury end of the market. It was established in 1997 and listed on the Shanghai Stock Exchange. In 2003, the company was merged successfully with Anhui Jianghuai Automobile Group, which remains Ankai’s largest shareholder with 20.92% of its share. Grantham-based Abacus Coaches has been told it will not face sanctions against its O-licence, after an Eastern Deputy Traffic Commissioner (DTC) acknowledged improvements owner David Thomas Cooke made to his maintenance facilities. Certification of Cummins Euro 6 ISL G natural gas engine is expected in October. The 8.9-litre engine is available from 250 to 320bhp for alternative fuel bus applications, with a peak torque of 1356Nm.